Proper nutrition is essential to the overall success of athletes at any level. No matter the sport, all of the activity is fueled by what the athlete consumes throughout the day, pre-performance, and post-performance. 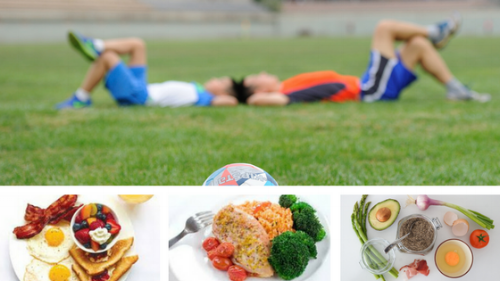 It’s one thing to be prepared by spending many hours practicing drills, skills, technique, and conditioning, but performance will be lacking if there are deficiencies in our young athletes’ daily food and fluid intake. I’ll be honest, when I look back at some of my favorite things to eat when I was a youth athlete, I can tell you with certainty that I had a sugar-heavy breakfast, sugar-heavy snacks, with just an “okay” lunch and dinner. That continued all the way through high school because, well, I just didn’t know any better, and neither did my parents. But, two things that did become staples for me were peanut butter & jelly sandwiches and a huge glass of milk. Interestingly enough, those two things would end up helping me significantly as I matured as a high school athlete. The truth is, for our young athletes to be high-powered performers, we need to make sure they put high-octane fuel in the tank. This is food that our bodies can easily recognize and break down into usable fuel for speed, strength, endurance, and power. It all starts with understanding some basic things about the calories we should be consuming. Calories are our energy source which is made up of three macronutrients: Protein, Carbohydrates, and Fats. Each one of these come in many different forms, both good and bad, but distinguishing between what’s optimal takes a bit of work. Kids will only learn what they are taught, and that starts with the adults in their lives. For this particular blog post, I will focus on protein, the supplements protein powder & creatine, and hydration. In the next series on nutrition for youth athletes, I will tackle carbohydrates and fats. Protein is essential for growth and repair; it is the building block and foundation for new muscle tissue during recovery. I don’t want to get overly scientific, but when protein is digested it is broken down into amino acids which are carried into the muscle tissue to repair the damage from excess exertion from activities. This is where lean muscle growth comes from. Not having enough protein does cause the body to take longer to recover. It also puts limits on strength and power development. Protein also has a thermic effect on the body, nearly twice as much as carbohydrates and fat, which means that it increases our metabolism. With a higher metabolism, the body will burn more body fat during the course of a day. However, unlike carbohydrates and fats, protein does not store in our system for later energy usage. This is why protein should be consumed with every meal. In fact, the RDA recommendation for the average adult is 0.8-grams of protein for every pound of bodyweight. That increases depending on the activity level of each person. Endurance athletes, the recommendation increases to 1.2-1.4g/lb., and strength athletes is a touch higher at 1.4-1.8g/lb. Our youth athletes can safely consume between 0.8-1.0 grams of protein for every pound of body weight each day. So assuming you have a 120 lb. child, they should have up to 120 grams of protein per day. But how do we make that happen? What does this look like? The typical profile of protein consists of 7-grams for every 1 oz. of meat. With that in mind, someone that has 3-ounces of chicken breast will have consumed 21-grams of protein. The optimal amount for protein usage is between 20-30g in a meal. Why? Because the body has a hard time utilizing protein for repair and recovery after 30-grams. This is called protein synthesis. So assuming you have a 120 lb. child, they should be having 4 meals a day with 20-30 grams of protein in each meal. As an example, here are some easy ways to find 20-30g of protein. For a high school athlete, it’s a breakfast consisting of 2 eggs & 3 egg whites, or 1-cup of cottage cheese or Greek yogurt. As you can see, it doesn’t need to be overly complicated. Another easy way to measure this for animal protein is to make a fist and have a serving size that matches the size of your hand. As a coach, I always encourage whole food options for the primary source of calories consumed daily. Our bodies operate and recover best when we consume all-natural earth grown nutrition. This means lean meats, fruits & vegetable, nuts, seeds, and high-quality dairy. One cloudy area is the use of supplementation among youth athletes, especially protein supplements. Enticed by the promise of “hope in a can,” teenagers tend to overuse the products, assuming that if one scoop is good, then four to five would be even better. The best option is quite easily the most accessible and cost-effective. Are you ready? It’s called MILK! One glass of milk can provide about 8-grams of protein and 12-grams of carbs. Chocolate milk is a great choice for post-exercise recovery. It provides high-quality protein (casein & whey) for repair, natural sugars to restore energy, electrolytes, AND flavonoids that are antioxidants. If a protein supplement is used, a whey protein ISOLATE is the clear choice because of the minimal processing and ease of digestion. Most whey protein isolates will provide approximately 25-grams per serving. Creatine is the most commonly used supplement and is popular among high school athletes. Creatine is touted for its ability to increase muscle bulk, strength, and performance in short duration, anaerobic events lasting 30 seconds or less. ‘Cons’ to consider include water weight gain that can affect balance and agility, GI discomfort, muscle cramps, a risk of contaminants including anabolic steroids, and it’s expensive in supplement form. The good news is, creatine is ingested naturally by consuming animal protein. Sixteen ounces of animal protein provides 2g of creatine, which is the daily requirement. Because our youngsters are still developing physically, the American Academy of Pediatrics & our colleagues at Children’s Hospital of Los Angeles Sports Medicine says creatine supplements are NOT recommended for anyone under 18-years old. 1. There is no evidence that drinking more than thirst is beneficial. That said, our youth athletes don’t always recognize or respond to their thirst, so we do need to educate them that pre-, during and post-exercise hydration is important. 2. Athletes should be hydrating normally during their day. 3. Fluids should not be restricted during an athletic event. 4. For activities less than one hour, WATER is best OR a glucose-electrolyte drink. 5. For activities greater than an hour, glucose-electrolyte drink. 6. Rehydrate frequently during exercise; drink 6 – 8 ounces of fluid every 15 – 30 mins. Let’s not confuse glucose-electrolyte commercial sports drinks with energy drinks. These are two completely different things. Energy drinks – A “Pick Me Up”; contains caffeine & sugar; “Food Supplement”; not regulated! Keeping your athlete properly nourished and hydrated can yield great benefits to their energy and performance during play as well as their recovery. It’s important to look at your child’s consumption of proteins as well as their hydration so that it’s balanced throughout the day. This can be tough in the middle school and high school populations, as they tend to eat at least one meal away from home. The best thing we can do for our youth athletes is guiding them with the guidelines laid out in this article and educate them on making the best choices throughout the day to fuel them. Collegiate and professional athletes should be their role models and proper nutrition starts with making the right food and hydration choices as a youth athlete. Below is a great video that was recently released by the USC Trojans Football Dietitian, Andrea Vanderwoude, with a sneak peek into what it takes to fuel a high-level athlete day-to-day. In it, she touches on a few key points that I’ve covered in this article. Take a few moments to watch it, and also keep in mind that these are all 17-21-year-old athletes as well.